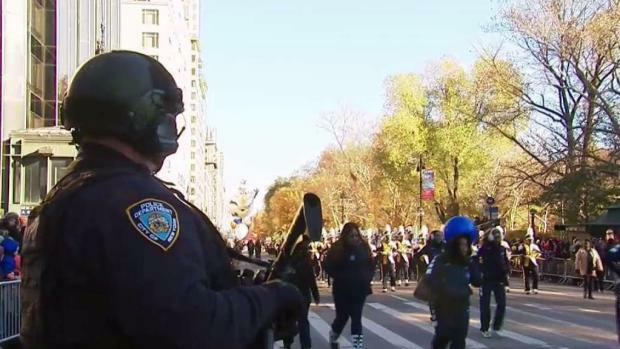 The Macy's Thanksgiving Day Parade marched, rolled and soared in traditional style Thursday as police went all-out to secure it in a year marked by attacks on outdoor gathering spots. Rana Novini reports. Parade coverage starts at 9 a.m. ET on NBC. Click here to watch it live online. 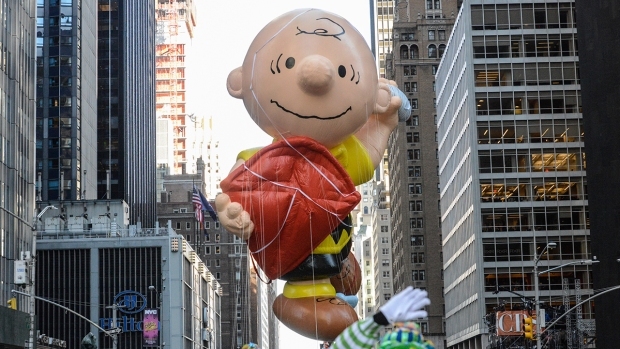 The Macy's Thanksgiving Day Parade marched, rolled and soared in traditional style Thursday as police went all-out to secure it in a year marked by attacks on outdoor gathering spots. With new faces and old favorites in the lineup, the Americana extravaganza made its way through 2 ½ miles of Manhattan on a cold morning. "The crowds are still the same, but there's a lot more police here. That's the age we live in," Paul Seyforth said as he attended the parade he'd watched since the 1950s. 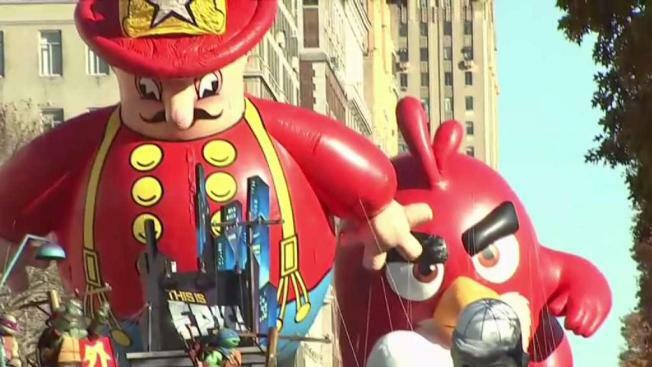 Marc Santia got an exclusive look at the NYPD's efforts to keep the Macy's Thanksgiving Day Parade safe. "Not a lot's changed - the balloons, the bands, the floats - and that's the good thing," said Seyforth, 76, who'd flown in from Denver to spend his 50th wedding anniversary in New York and see this year's parade. The televised parade was proceeding smoothly, though about midway through, a gust of wind on a largely calm day blew a candy-cane balloon into a tree branch, and it popped near the start of the route on Manhattan's Upper West Side. No one was injured. 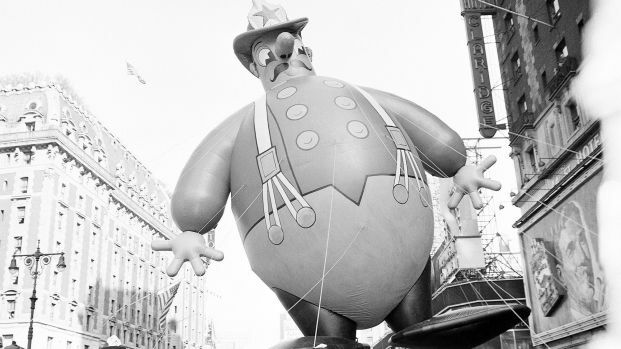 In 2005, one of the parade's signature giant balloons caught a gust, hit a Times Square lamppost and injured two people. The candy cane was smaller than the giant balloons. Timothy McMillian and his wife, their 9-year-old daughter and his in-laws started staking out a spot along the route at 6:30 a.m. They'd come from Greensboro, North Carolina, to see in person the spectacle they'd watched on TV for years. McMillian, a 45-year-old schoolteacher, booked a hotel months ago, but he started to have some concerns about security when a truck attack on a bike path near the World Trade Center killed eight people on Halloween. "With the event being out in the open like this, we were concerned," he said. "But we knew security would be ramped up today, and we have full confidence in the NYPD." Authorities say there is no confirmation of a credible threat to the parade, but they were taking no chances after both the truck attack and the October shooting that killed 58 people at a Las Vegas country music festival. NYPD officers with assault weapons and portable radiation detectors were circulating among the crowds, sharpshooters were on rooftops and sand-filled city sanitation trucks were poised as imposing barriers to traffic at every cross street. Officers also were escorting each of the giant balloons. The mayor and police brass have repeatedly stressed that visitors shouldn't be deterred. And Bekki Grinnell certainly wasn't. "When your kid from Alaska is marching in the Macy's Thanksgiving Day Parade, you come," said Grinnell, whose daughter was marching with the band from Colony High School in Palmer, Alaska. Grinnell said she wasn't worried about security because of the police presence: "I think we're in a safe spot." Other paradegoers also showed their appreciation for police: The NYPD marching band and a group of mounted officers got some of the biggest cheers from spectators lined up as many as 15 deep along barricades. Among other crowd favorites: as did the SpongeBob SquarePants balloon. The 91st annual parade featured new balloons including Olaf from the Disney movie "Frozen" and Chase from the TV cartoon "Paw Patrol" will be among the new balloons Thursday, along with a new version of the Grinch of Dr. Seuss fame. Smokey Robinson, The Roots, Flo Rida and Wyclef Jean were among the stars celebrating, along with performances from the casts of Broadway's "Anastasia," ''Dear Evan Hansen" and "SpongeBob SquarePants." The lineup included a dozen marching bands, as well as the high-kicking Radio City Music Hall Rockettes - and, of course, Santa Claus. "This is my favorite thing ever," musician Questlove told The Associated Press as he got ready to ride the Gibson Guitars float with his bandmates in The Roots and late-night host Jimmy Fallon of "The Tonight Show," where The Roots are the house band. Questlove said being in the parade is "probably my favorite perk" of the job. "To go from being a spectator to being up here, it's kinda cool," he said.